rule+3. 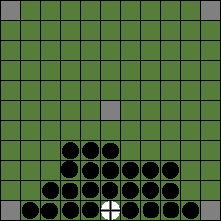 The overall board position may be repeated no more than three times (except for the white win edge fort exit - which isn't really a repetition as the game has ended). The player who maintains the situation ("the threatening player") must find another move to break the repetitions. rule+3a. The white board position may be repeated no more than three times. White must find another move to break the repetitions. rule+3b. The black board position may be repeated no more than three times. 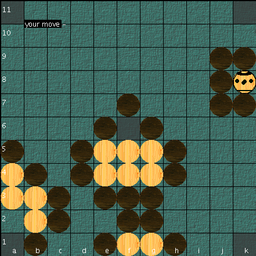 Black must find another move to break the repetitions. rule+3 covers the intertwined perpetual step dance of any complexity, three times around the board or whatever. rule+3a covers white draw forts where it's white alone who does the repetitions. rule+3b covers fx. the situation where black just barely blocks all corners. A repetition ban forces black to leave the corners, and the game will end a draw because of lack of white and black pieces. Adam wrote: Though I hasten to add that if that includes corner capture [of the king] with two men and a corner refuge, then I'd consider this a rather severe handicapping. If very much needed, the corner squares could be friendly to the king? This might be an idea anyway, because it is the neighbour corner square safe for the king which is the source of a lot of the interesting combinations and quick and elegant king exits, which are so characteristic of Fetlar. It is not very important for these fine combinations whether the king is safe on rest of the edge, too. The German Trebeta reenactment group had a Hnefatafl rules set with the kings' squares friendly to all whites and the king. This looks like a drawback for the battle, as it spoils the corner fights. But friendly just to the king and only corners? By the way all these rules adjustments address draw situations in the end games. 90% of the Copenhagen games turn out to be pure Fetlar games and are unaffected by the draw-adjustments. Only with the exception of the innovation "white win edge fort"; and a removal of the special Fetlar edge rule also affects the game. "White wins when the king succeeds in escaping to one of the corner-squares. Here he is free and invulnerable." Period. "Black wins by taking the king. ... Black has also won if the situation arises that all white's pieces have been rendered immobile by encirclement." In which case this rule from Skalk covers rule+1, rule+3a and rule+4 of this discussion. Hagbard wrote: By the way all these rules adjustments address draw situations in the end games. 90% of the Copenhagen games turn out to be pure Fetlar games and are unaffected by the draw-adjustments. This has been my experience, so far, with Copenhagen games - most of them have been identical to fetlar rules. A couple of games have been affected by the dismissal of perpetual check(copenhagen rule #3), a couple have been white wins by edge fort(copenhagen rule #2), and I have not yet had a game end with total enclosure (copenhagen rule #1). And less draws than ever! rule+1) Black wins by taking the king (as described in the Fetlar rules). Black has also won if the situation arises that all white's pieces have been rendered immobile by encirclement. rule+2) White wins when the king succeeds in escaping to one of the corner-squares. White also wins if the king has contact with the board edge, is able to move, and it is impossible for black to capture him (white win edge fort). rule+3) Perpetual moves are forbidden. 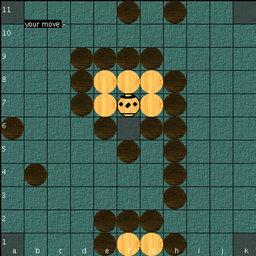 If the overall board position is repeated three times, the player who maintains the situation ("the threatening player") must find another move to break the repetitions. If the white board position is repeated three times, with no pieces being captured, white must find another move to break the repetitions. If the black board position is repeated three times, with no pieces being captured, black must find another move to break the repetitions. rule+5) Capturing on the board edge by using the shieldwallrule. If there is the same number of opposing taflmen in a row in front of a row of taflmen the whole group can be captured at once by bracketing them. Ad rule+3: It might not be possible for white to break repetitions and find any alternative move in case all the white pieces are somehow encircled. And so white lost already because of the encirclement before the repetitions. But the repetitions rule is useful for the software as an easier way to detect encirclements of any complexity. Hagbard wrote: Are the contours of the Copenhagen rules beginning to form? I think we should wait and see how the tournament pans out, and perhaps add in my and crusts results from our test games too. Much as I like the idea of the shield wall rule, I personally would like to see a further round of test games to see if it makes a good addition before we agree to add it. The same goes for departing from the fetlar edge and corner rules. These should really only be adjusted if the draw free version of fetlar, with the mobile-king edge-fort-exit, really does require a balancing adjustment. Again apologies for not being in the test tournament. I'm struggling to find game time outside of my i phone, so dragonheels works for me just now. My gamer tag there is Xonn. Hagbard and I are now having our tournament game there. So if anyone wants to have a strong copenhagen match with me, send me an invite on dragonheels! On the edge rule - whether or not the king should be captured on the board edge. Under the Fetlar edge rule, the king in the diagram is not captured - even though he very much indeed looks captured. This a bit awkward situation is avoided when allowing the king to be captured on the edge. There's not the same inconvenience, however, by letting the king be protected on the corner neighbour edge squares only, as in this diagram. The king promptly escapes to the corner next move and the game is over. Hagbard wrote: On the edge rule - whether or not the king should be captured on the board edge. Very funny image! Zombies indeed. However I feel I must defend our king here. If we are to imagine that the rules represent a model of reality, then our rule that we need 4 warriors to take down a king tells us that, for whatever reason, he needs to be attacked from all four sides, unless that side is against a throne square (again, for whatever reason, maybe its covered in spikes and thereby 'attacking' him.). So really, of course, the king in this image is surround only by 3 warriors, the other guys can't get at him, so they are irrelevant. Trapped he is, dead he is not, simply because we have already accepted that you have to have a fourth man to knife him in the back. So I think this image, while very entertaining, is rather misleading. Its thin ice to say the king should be captured against the board edge, as then we need to ask why men are not captured against the board edge. An immobilised king is not the same thing as a dead one. And king immobilisation/isolation is an important tactic for black. Back to the shieldwall - I had a nice game with Hagbard with a good example of a shieldwall situation. Shieldwall didn't count the corners and it is although realistic. Did you ever try to fight with a wall in the back or at the abyss edge? A further advantage of the shieldwall rule is, that white can not start to force a edge-fort early in the game. More on how to capture the king. The king is placed on the throne and is captured by normal, standard surrounding with 4 blacks. The king is placed on a square neighbouring the throne and is captured by surrounding with 3 blacks plus the throne. The throne has to function as a hostile square, otherwise it wouldn't be possible to capture the king in this position. The king is placed on the board in some distance of both throne and edges and is captured by standard surrounding with 4 blacks. The king is placed on the edge in some distance of the corners. 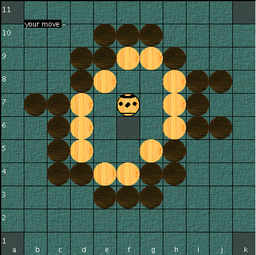 In "ordinary Hnefatafl" the king is captured by surrounding with 3 blacks plus the edge. 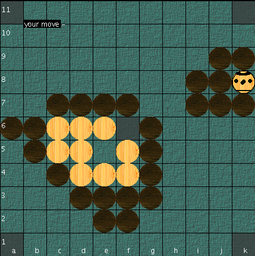 Whereas in Fetlar Hnefatafl, the king cannot be captured on the edge. This rule has the drawback that it can result in situations like "the zombie attack" mentioned above in this thread. The advantage of the Fetlar rule appears more when the king is placed not on any edge square, but precisely on a square neighbouring a corner. The king is placed on a square neighbouring a corner. In "ordinary Hnefatafl" the king is captured by surrounding with 2 blacks plus the corner square plus the edge. 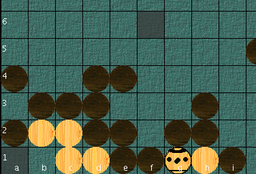 This rule has the drawback that it's particularly easy for black to capture the king here with only 2 men. 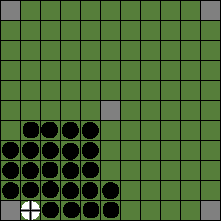 Whereas in the Fetlar variant, the king cannot be captured in this position and so the drawback is avoided, and furthermore the protection of this particular square turns out to be a source of an abundance of fine combinations in the corner fights. The king cannot reenter the throne, and noone can pass through the throne. The king is placed on the throne and is captured with 4 blacks as before. The king is placed on a square neighbouring the throne and is captured with 3 blacks plus the throne as before. But now it's obvious that the king really is captured, because he cannot move away to or through the throne. The king is placed on the board in some distance of both throne and edges and is captured with 4 blacks as before. The king is placed on the edge in some distance of the corners and is captured with 3 blacks plus the edge, as before in "ordinary Hnefatafl". "Zombie attack" situations are avoided. The king is placed on a square neighbouring a corner and cannot be captured (because he can move away to the corner), as before in Fetlar Hnefatafl. The all too easy capture of the king with 2 men is avoided, and all the advantages of the Fetlar corner fights are preserved. Swedish historians, and Ashton and Cartier arrived at the same throne properties: non-reenterable and non-passable (Swedish tablut, Ashton tablut and Cartier tablut).